All Julian homes currently listed for sale in Julian as of 04/26/2019 are shown below. You can change the search criteria at any time by pressing the 'Change Search' button below. "160 acres of paradise. Quiet & secluded yet only 2 miles from Historic Julian. Serenely beautiful 2.66 acre aerated lake that is 20' deep. Massive ancient oaks, cedars & poplars. Main house, guest house, separate caretaker's house, huge outdoor cooking pavilion for large parties, children's playground area, several outbuildings, three large barns, one with an attached caretaker's apartment, regulation baseball diamond with dugouts, & candle shop. Four legal parcels & zoned for 3 more homes. 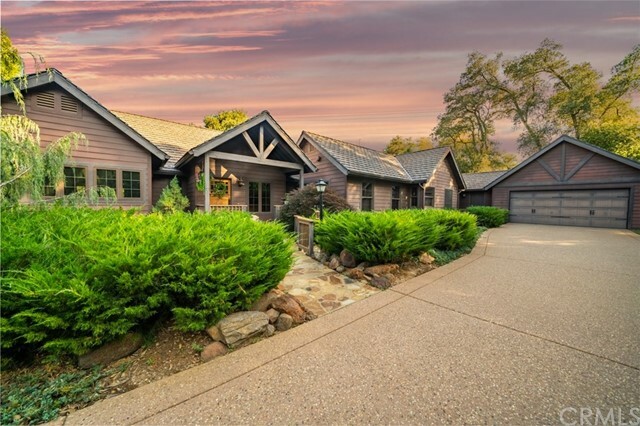 Neighborhoods: Near Hoskings Equipment: Range/Oven, Washer Other Fees: 0 Sewer: Septic Installed Topography: LL,RSLP"
"Prepare to be wowed by this Custom Lindal Cedar Home, situated on over 20 majestic view acres, in the exclusive gated community of Cuyamaca Forest Ranch. No expense was spared in the building of this unique and beautiful turnkey home featuring 24 foot open beamed ceilings, Brazilian teak hardwood flooring and floor to ceiling stone fireplace with custom mantle. The chef's kitchen includes custom cabinetry, slab granite countertops, monogram appliances and paneled dishwasher. Neighborhoods: Cuyamaca Forest Architectural Style: Custom Built View: Custom Built Equipment: Dryer,Fire Sprinklers,Garage Door Opener, Shed(s), Washer Other Fees: 0 Sewer: Septic Installed Topography: ,RSLP"
"This glorious 3392 square feet private mountain retreat with the outdoorsman in mind was flawlessly custom built in 1998 by a log-home architect, using ten inch Douglas fir logs. This owner builder's masterpiece was constructed by using the Precision Craft Log Home continuance thru bolt system, which provides this the highest earthquake rating. Expansive octagonal windows overlook Stonewall Peak, Cuyamaca Peak & Middle Peak with a 180-degree view of the lake, meadow, and mountains. Neighborhoods: Lake Cuyamaca Architectural Style: A-Frame/Dome/Log View: A-Frame/Dome/Log Equipment: Dryer,Garage Door Opener,Pool/Spa/Equipment, Range/Oven, Satellite Dish, Washer, Water Filtration Other Fees: 0 Sewer: Septic Installed Topography: LL,RSLP,GSL"
"Wood and stone meet space and style with this Craftsman-inspired home. Built by the current and original owner, pride of ownership shows in every detail from the hand-treated open beams to the adjustable recessed lighting. With 3,810 square feet and 4 en suite bedrooms, this home can be a year-round residence or magnificent vacation getaway. The house is situated on over 8 acres and is surrounded by other large parcels, giving it the feeling of a remote country estate. * SEE SUPPLEMENT & VIRTUAL TOUR* Neighborhoods: Julian Equipment: Dryer,Garage Door Opener,Pool/Spa/Equipment, Satellite Dish, Washer, Water Filtration Other Fees: 0 Sewer: Septic Installed Topography: GSL"
"Magnificent English Tudor style manor, 9.77 acres in gated Julian Estates. Architectural detail and high craftsmanship throughout. 4150 sq.ft. includes 800 sq.ft. guest home. MBr. suite is over 1000 sq.ft. Downstairs garage, shop, work area, approx. 1000 sq.ft. plus over 1000 sq.ft. nursery. The 9.77 acres is slightly sloping meadow with some forest. Ideal for equestrian development. Japanese Garden with features of Sakuteiki. Solar panels supply about 90% of energy needs. Absolutely sensational! Neighborhoods: Julian Estates Equipment: Dryer,Fire Sprinklers,Garage Door Opener, Satellite Dish, Washer Other Fees: 0 Sewer: Septic Installed Topography: ,RSLP Guest House Est. SQFT: 800"
"Variance Granted for Detached.Your opportunity to own this unique scenic view location and San Diego's Mountain Retreat Paradise is Here and Now. Experience a tour of this Custom Builder's private home and become stunned as the outdoor vistas combine with the well-designed interior to create an ambiance of living art. Overlooks Cuyamaca Lake and Rancho Cuyamaca State Park's captivating, breathtaking mountain and lake views from this home's exclusive vantage point and enjoy Nature's Four Seasons. Neighborhoods: Julian Other Fees: 0 Sewer: Septic Installed Topography: LL,GSL"
"A masterful integration of natural elements and exquisite craftmanship converge, creating a tranquil and aesthetically stunning living experience. Located on 4.8 acres in the highly desirable Julian Estates, this 2006 custom built home sits on a quiet cul-de-sac and affords a wealth of amenities. The 2800 esf main home welcomes you with its rich landscape and country architecture, which blends harmoniously with its native locale. The foyer, rich with natural light, leads to the discovery of the beauty that lies within. A grand stone fireplace reaches floor to ceiling and expansive windows invite the incredible forested views in from every perspective. The 1200 esf guest home enjoys its own private entrance and attached garage while maintaining its seamless assimilation with the main residence. A wealth of features and a fluid design make this home handsomely unique in all respects. Come and explore all that awaits at this private and tranquil setting and make this mountain dream home your own!" "A masterful integration of natural elements and exquisite craftmanship converge, creating a tranquil and aesthetically stunning living experience. Located on 4.8 acres in the highly desirable Julian Estates, this 2006 custom built home sits on a quiet cul-de-sac and affords a wealth of amenities. The 2800 esf main home welcomes you with its rich landscape and country architecture, which blends harmoniously with its native locale. Neighborhoods: Julian Estates Other Fees: 0"
"Two single story homes on a 4.39 Ac Lot: Scenic, Serene and Picturesque only minutes from Julian's downtown. This Estate s main house includes a huge great room with vaulted ceiling & amazing views, 4 bdrms, 3 baths and a connected in-law unit with a pvt entrance. In-law includes 1 bdrm, full bath, kitchen, & living room w/fireplace. The estate also includes a separate Guest House with a kitchen, living room, 2 bedrooms and finished 2-car garage. See Supplement. Neighborhoods: Julian Architectural Style: Custom Built View: Custom Built Equipment: Fire Sprinklers, Satellite Dish Other Fees: 0 Sewer: Septic Installed, Perc Test Completed Topography: LL,GSL Guest House Est. SQFT: 1584"
"Imagine living at your own private retreat and earning $$ with never having to leave. This property has the unique potential for either a beautiful multi-family home, a profitable turnkey Bed & Breakfast or vacation rental. Each of its 5 uniquely themed guest rooms along with a newly added owner's quarters, all feature their own private sitting area & fireplace. Located just one mile east of the historic town of Julian and situated in a rustic oak park-like setting. A must see with endless possibilities. Neighborhoods: Whispering Pines Other Fees: 0 Sewer: Septic Installed Topography: RSLP,GSL"
"Buy a beautifully remodeled, gated ranch house situated on 8.22 fully-fenced acres in picturesque Pine Hills. It includes the main house, detached guest house, over-sized 2+ car garage with workshop area, a yoga studio, and a 6-stall horse barn. Home features and finishes include two large master suites with over-sized luxury baths, an efficient kitchen with high-end Viking range and sub-zero refrigerator, granite counters, tile floors, and an open concept plan and plantation shutters throughout. Neighborhoods: Pine Hills Other Fees: 0 Sewer: Septic Installed Topography: LL,RSLP,GSL, Guest House Est. 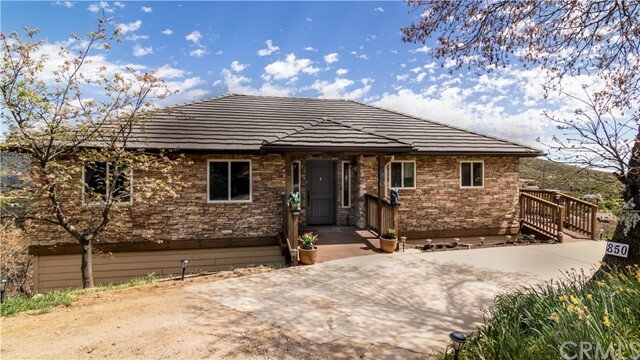 SQFT: 688"
"This is a lovely & simple 2 BR - 2 BA country home of 1527sf with acreage & breathtaking views of Lake Cuyamaca plus the surrounding Mountains. The home boasts a wonderful open concept kitchen with complete flow to dining & living room. Master BR & living room/kitchen have sliding glass doors & large windows facing the Lake. It's incredible how the entire home is just bathed in light & allows a delicious cross breeze through the house. The large deck faces the Lake. Come see it and fall in love. Neighborhoods: Cuyamaca Equipment: Dryer, Washer Other Fees: 0 Sewer: Septic Installed Topography: LL,GSL"
"First time on the market! Don't miss the magnificent views from this custom log home. Walk up the porch and through the front as you are drawn to the custom chandelier hanging from the massive log beams. The custom maple cabinets and stunning granite counters make the kitchen and entertainer's dream. Huge master bedroom leads out to a huge deck overlooking the rear of the nearly 5 acre property. The finished garage/basement is 72'x32' with 240v power provides all the room for any hobby. This is special! Neighborhoods: Julian Architectural Style: A-Frame/Dome/Log View: A-Frame/Dome/Log Equipment: Fire Sprinklers Other Fees: 0 Sewer: Septic Installed Topography: ,LL,,GSL"
"Offering spectacular views from Julian s Volcan Mountain to the Salton Sea, this is a spacious, open, light, immaculate home on 2.54 acres. The property has a fenced area for the pets, chicken coop, 2 car garage, bamboo flooring, new carpets and paint, and is move-in ready. A separate bedroom, closet, bath combo on the lower level has many different possibilities for that teen or in-law in your life. Charming native stone rock walls enclose a garden space within the circular driveway. 3BR + bonus room. Neighborhoods: Kentwood Equipment: Garage Door Opener Other Fees: 0 Sewer: Septic Installed Topography: ,SSLP"
"Beautiful custom home on 2.5 acres in the welcoming community of Wynola. Formerly a working apple orchard, the property includes over 400 fruit trees and hosts the largest and oldest apple tree in Julian! Located immediately off Wynola Rd., the gated entry leads to a sizeable paved drive and the wondrous home beyond. Covered RV parking and a 2-car garage provide plenty of room for storage. There is much more to explore here. Bring your vision and come discover all of the opportunity that awaits! Neighborhoods: Wynola Equipment: Garage Door Opener, Shed(s) Other Fees: 0 Sewer: Septic Installed Topography: LL"
"Including Viking Stove, custom cabinetry as well as the added benefit of an included accessory dwelling unit option, at under $194 per square foot, this Chateau In The Woods is a value with lots of upside in a neighborhood that sells for significantly more. Sitting on over 2 acres, enjoy elegantly exposed wood beams and exposed brick throughout this custom home. Ample parking for visitors, RVs, boats, etc. AND A COMMUNITY POND AND NORMAL WATER USE ARE INCLUDED WITH YOUR ANNUAL COMMUNITY MEMBERSHIP. Neighborhoods: Deer Lake Park Equipment: Garage Door Opener, Satellite Dish, Shed(s), Vacuum/Central, Washer Other Fees: 1300 Sewer: Septic Installed"
"Come see this newly remodeled two-story home with its breathtaking 360-degree views that sweep southwest from the Pacific Ocean, northward across to the spectacular Volcan Mountains. Here you can enjoy the sunrise and sunset from the privacy of your own home plus four acres in which to roam. Interior and exterior upgrades include finished landscaping, an extra-large guest suite with large private bath with large walk-in tile shower with dual shower heads,*SEE SUPPLEMENT BELOW* Neighborhoods: WYNOLA ESTATES Equipment: Garage Door Opener, Range/Oven Other Fees: 40 Sewer: Septic Installed Topography: SSLP"
"On a winding country lane on the outskirts of Julian s historic district, this charming home sits on 4.23 gently rolling acres. The seasonal pond with gazebo is a delightful feature of the park-like grounds. A flat area with electric hookup is ready for multiple uses. The interior has vaulted ceilings in the living room & master bedroom, a bonus room currently used as a workshop, a kitchen with a center island, and a two-sided fireplace between the master bedroom & jetted tub. The perfect country home! Neighborhoods: Historic District Equipment: Dryer,Fire Sprinklers, Washer, Water Filtration Other Fees: 0 Sewer: Septic Installed Topography: GSL"
"Spectacular View Home - One of a Kind - in picturesque Pine Hills. On a clear day you can enjoy seeing the Pacific Beach, Catalina, nearby mountain peaks from the custom mountain home situated on 2.1 acres. Adjacent 1.5 acres included APN#289-400-20-00 making property total for 3.6 acres. Gorgeous stained glass windows adds to the incredible views from the family room. Huge 11x47 workshop, jacuzzi in the enclosed patio, multiple decks to also enjoy starlit nights. Custom built with an artistic flair! Neighborhoods: Pine Hills Architectural Style: Custom Built View: Custom Built Equipment: Dryer,Fire Sprinklers,Garage Door Opener, Range/Oven, Satellite Dish, Washer Other Fees: 0 Sewer: Septic Installed Topography: LL,GSL,SSLP"
".. Truly one of a kind private secluded 5+ acres property of meadow and oak forest located @ the end of a private lane w/ hundreds of native Live Oak, Black Oak, Manzanita, Ceonothus. Seasonal pond 1976 SF w/CSTM Cherry cabinets, Granite counter tops, CSTM bathroom cabinets / marble countertops, 3000 sf Wrap Around Deck w/ Oak Tree Surround. Stained Glass Windows by Artist Sally Snipes. CSTM Closets, upstairs laundry & Storage Galore. 1000's of Daffodils, Fruit trees, etc... Neighborhoods: Pine Hills/ Deer Lake Equipment: Dryer, Satellite Dish, Washer Other Fees: 0 Sewer: Septic Installed Topography: RSLP"
"Beautiful custom 3BD/2.5BA Western Cedar home with floor to ceiling windows. The house has a new roof, kitchen, appliances, porcelain tile floors, and water heater and has been freshly stained and sealed. It s situated in Pine Hills, a great neighborhood, on a 1.01 acre Oak and Pine tree filled lot with expansive Northwesterly views. Enjoy four gentle seasons just over an hour from San Diego. Open floor plan, wood burning stove, generous deck, and an attached two-car garage w/ loads of storage. SUPPLEMENT Neighborhoods: Pine Hills Equipment: Garage Door Opener, Washer Other Fees: 0 Sewer: Septic Installed"
"Ready to escape to the gorgeous mountain vistas of Julian? Then do not miss this breathtaking property. Contractor's home, lovingly built by the current owner in 2006. Situated on over an acre of hillside with soaring vistas, this home is built to take maximum advantage of it's stunningly beautiful surroundings. Every window is a vantage point to nature's perfect artwork. Solidly built decking adds to enjoyment of the views. Looking for multi-generational living or income? Enjoy the full 1BR/1BA detached guest house with kitchen. Entertain friends and family in the amazing outdoor pavilion, and when the festivities are over, how about a relaxing soak in the outdoor Jacuzzi, fully enclosed by custom gazebo. So many unseen features as well. Fully paid solar panels with 0 electric bill reported by seller. Innovative fire safety features. Excellent producing well. This home was built to last! Start your family legacy here!" "Ready to escape to the gorgeous mountain vistas of Julian? Then do not miss this breathtaking property. Contractor's home, lovingly built by the current owner in 2006. Situated on over an acre of hillside with soaring vistas, this home is built to take maximum advantage of it's stunningly beautiful surroundings. Every window is a vantage point to nature's perfect artwork. Solidly built decking adds to enjoyment of the views. (SEE SUPPLEMENT) Neighborhoods: Julian Equipment: Fire Sprinklers Other Fees: 0 Topography: ,"
"BRAND NEW CUSTOM HOME In Whispering Pines, one of the close-in neighborhoods near to the charming historic town-site of Julian, CA. This new home is situated on a beautiful .59 acre lot studded with beautiful mature pine and oak trees. This parcel has a very desirable mix of stellar views of the Volcan mountain range to the north, and a substantial area of usable flat area perfect for gardening or play area for children. Local builders of fine repute. Neighborhoods: whispering pines Equipment: Fire Sprinklers Other Fees: 0 Sewer: Septic Installed"